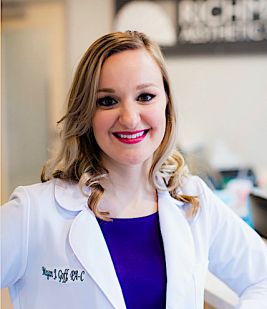 Megan J. Goff is a board certified surgical physician assistant at our medical spa. She earned her Bachelor of Science in Biology from James Madison University in 2007. While at JMU, Megan performed research in the field of genetics and participated in the local Big Brothers Big Sisters program. Megan continued her education at one of the top physician assistant programs in the country, Shenandoah University, where she received her master’s degree in 2012. During her master’s program, she served as fundraising chair of her student council and participated in an international medical mission trip. As a physician assistant, Megan is committed to providing the highest level of care to her patients. She enjoys being involved in the entirety of our patients’ experiences at Richmond Aesthetic Surgery by meeting them during their consultation, assisting in surgery, and providing follow up care. Megan strives to make a true difference in the lives of her patients through compassion and tailoring to individual needs. Megan was recently recognized by the Virginia Academy of Physician Assistants for the PA/Physician Partnership of the Year with Dr. Zemmel and Our Health Richmond for Best Bedside Manner for her tremendous care and skill. Megan is very passionate about helping patients with breast cancer. She is devoted to supporting and empowering patients and community members in their fight against breast cancer and their journey to wellness. Megan is excited to work with Richmond Aesthetic Surgery to support breast cancer patients. She is also a Komen educator for the Susan G. Komen organization. Her goal is to raise awareness about the importance of breast health issues in the community. Megan is a member of the American Academy of Physician Assistants, the Virginia Academy of Physician Assistants, and HYPE, the young professional organization of the Greater Richmond Chamber of Commerce. Outside of work, Megan lives with her husband Matt in Midlothian, and they enjoy boating and traveling, especially abroad.